The POLYWOOD® Nautical Bar Chair features two arm rests, a handle space to allow for easy moving, and a high back that allows for comfortable support. The simplistic design allows for maximum versatility no matter where you place the polywood chair. So sit back, relax, and enjoy the breeze as you watch nature go about its business while you unwind from a long day. Our eye-catching Nautical Collection, with its signature headboard, features a variety of seating options. Choose from standard and high back dining chairs along with bar chairs, benches, and swings. Polywood nautical dining chairs feature three adjustable positions and fold flat for storage. Available in our 6 Traditional colors, this All-Weather Collection withstands a demanding marine environment. 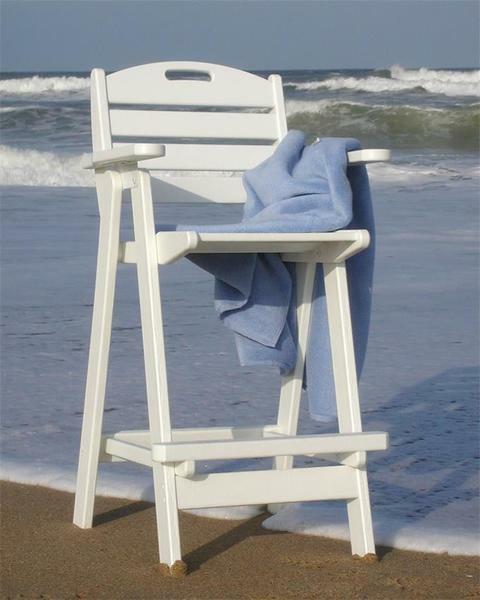 If you have any questions about the POLYWOOD Nautical Bar Chair, any of our other products, or wish to place an order over the phone, give one of our friendly Amish Furniture Specialists a call toll-free at: 1 (866) 272-6773. Boxed Dimensions - 47" x 26" x 8"